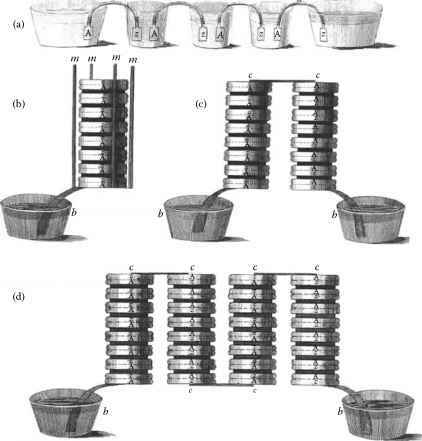 FIGURE 32.1 Volta's 1800 illustration of the voltaic cell from its early development as a series of buckets (a) to a series of cell piles (b-d). systems. 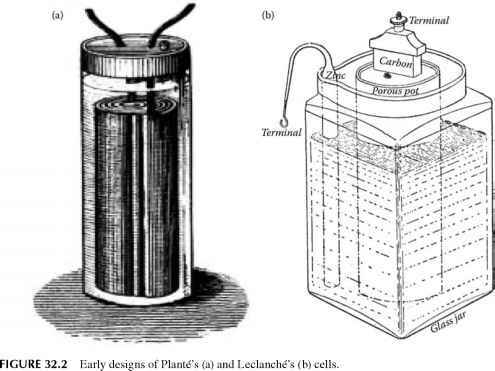 Such efforts yielded more dividends as further contribution to battery development was made by yet another French engineer, George Leclanche, when he developed his wet cell in 1866. In his design, Leclanche used a cathode of manganese dioxide mixed with carbon and an anode of zinc in the form of a rod (Figure 32.2b). batteries the convenient power source they are today. Credit goes to Carl Gassner of Mainz, Germany, who patented this technology in 1887.1 In constructing his dry cell, Gassner mixed ammonium chloride with plaster of paris to create a paste, with a bit of zinc chloride added to extend the shelf life. The manganese dioxide cathode was dipped in this paste, and both were sealed in a zinc shell, which also acted as the anode. Unlike previous wet cells, Gassner's dry cell was more solid, did not require maintenance, did not spill, and could be used in any orientation. It provided a potential of 1.5 V, and its first mass production was under the brand name the Columbia dry cell. This type of cell was first marketed by the National Carbon Company (NCC) in 1896. In 1899, the nickel-cadmium battery, the first alkaline battery, was invented by a Swedish scientist named Waldmar Jungner. The special feature of this battery was its potential to be recharged. In construction, nickel and cadmium electrodes in a potassium hydroxide solution, it was the first battery to use an alkaline electrolyte. This battery was commercialized in Sweden in 1910 and reached the Unites States in 1946. The first models were robust and had significantly better energy density than lead-acid batteries, but nevertheless, their wide use was limited because of the high costs. Although the technology has been refined by over a century of development, the concepts and chemistry are the same as Gassner's first dry cells. Most of today's exotic rechargeable battery systems such as nickel-cadmium, nickel-metal hydride, and the variety of lithium-based cells are twentieth-century developments. It is therefore notable that new chemistries are no longer being discovered through experimentation as the principles of battery design and operation are well known, but rather, new efforts in battery design focus on making the optimal chemistries work in practical cells.1 The growth of battery technology has since revolutionalized and several models of long-lasting battery life have been developed. These range from the nickel metal-hydride battery of the late 1980s to the lithium and lithium-ion batteries of the 1970s and 1990s. This is the process in which soft lead (99.97% pure) is converted into lead oxide. To achieve this, solid bars of soft lead are melted at 400-425°C and the molten lead is oxidized to form lead oxide. The lead oxide so formed, along with some percentage (about 26%) of free lead, is then passed into a cyclone separator and a bag filter. This step is important as it allows the particles of lead oxide to be separated from the air stream in these equipments. The separated lead oxide is then transferred using screw conveyors into storage tanks, called silos. However, air emissions from the bag filter contain lead particles, a source of pollution. Grid casting involves melting bars of lead alloy in a lead melting pot. This is followed by pumping molten lead into the grid molds, which are subsequently cooled by means of cooling water. After the mold has cooled the alloy, it opens to discharge the grid, which is subsequently trimmed to remove the excess lead. The resultant cuttings are then recycled into the lead pot. All these operations take place in one machine, which is completely automated. During this process, different types of lead alloys are used for casting of grids. They may have different thicknesses depending on the thickness of the alloys used. Furthermore, grids are classified on the basis of the type of alloy used and the thickness of the grid casted. It should also be noted that melting of lead causes dross formation as well as generation of some solid wastes. Nevertheless, rejected grids are remelted in the lead melting pot and recycled. Two types of pastes are manufactured, one for positive plates and the other for negative plates. For the lead-acid batteries, the materials required for paste manufacturing are lead oxide, sulfuric acid, water, and other additives. These additives are different for positive and negative pastes. The ingredients, in the paste mixer, are mixed together in a fixed ratio (ratio of various ingredients depends on the type of grid to be used for plate manufacturing) to form the paste, which is then pasted on the grids. Lead oxide is the major ingredient used in paste manufacture accounting for about 85% of the paste. During paste formation, losses occur due to evaporation and the vapors resulting from the process are treated in a scrubber and then discharged through a stack. Plates are formed as a result of applying paste onto grids using machines. The pasting machine is divided into four sections, namely, feeding, pasting, drying, and collection. The grids are fed onto the conveyor belt by a feeding mechanism and the paste is applied on them. The pasted grids are passed between rollers where even spreading of paste occurs. Subsequently, the paste is dried in a flash drier and the dried plates are collected and stacked at the extreme end of the pasting machine. The plates are moved into different sections, namely, pasting, drying, and collection, with the help of the belt conveyor system. Finally, the plates are classified depending on the thickness of paste on a particular type of grid. Reject plates and excess paste applied onto the grids are generated in this section. Also, washing of equipment generates wastewater streams, which are contaminated with "paste," which essentially contains lead. Curing is the process of exposing plates pasted positive and negative to a regime of (a) controlled time (minimum 32 h), (b) temperature (30-35°C), and (c) relative humidity (> 90%). This process converts the free lead into lead oxide, using oxygen from the surrounding air. The plates are allowed to cure for a minimum of 32 h. Care is also taken to ensure that the maximum temperature of the plate does not exceed 60°C. The cured plates are then parted. This operation is also performed using machines. The cured plates are fed into the parting machine by mechanical means. The plates are parted in the machine and then collected when the operation is completed manually. The parted plates are thereafter stacked for use in battery assembly. More rejects are also generated in this section as well as some lead dust. The ventilation system in this area ensures that the lead dust generated is removed from the work area and discharged into the atmosphere through a baghouse filter. The first operation in this area is that of enveloping of positive plates. This envelope, which may be a polythene sheet, acts as a separator that electrically isolates the positive and negative electrodes. A mechanical vacuum system is used to feed positive and negative plates for automatic stacking. The positive and negative plates are stacked together in the desired sequence and encased. However, before the plates are encased, several other processes such as lug brushing, melting of lugs, cast-on strap, intercell welding, and fixing covers are carried out. After the plates are assembled in the container, they are mounted on a conveyor for the finishing operations that involve a shear test, heat sealing, terminal burning, and leak testing. The product at this stage is called a dry uncharged battery. The number and types of positive and negative plates in each battery depend on the type of battery being manufactured. Nevertheless, for a particular type of battery having a specified capacity, the number and types of positive and negative plates are generally fixed. The activities in this section generate rejects of plates, dross, and lead dust. The vacuum system generates lead dust due to feeding of plates, which is discharged to the atmosphere through a baghouse filter. The dry uncharged battery now needs to be charged by the addition of an electrolyte, which in the case of the lead-acid battery is sulfuric acid. Accordingly, the battery is filled with sulfuric acid (a specific gravity of 1245-1255 at 25°C) and placed on tables and then cooled with water. The operations of filling and emptying sulfuric acid from the battery are performed automatically using machines. Acid is filled by gravity flow into the cell to a level considerably above the plate tops. The positive and negative terminals of the battery are connected to the electric connections and the electric current is passed for a fixed duration of time during which the battery is charged. Different batteries have different currents for charging and different charging systems are, therefore, used. Charging is indicated as complete when there is no change in specific gravity over a 3-h period. Thereafter, the sulfuric acid is emptied from the batteries, a new solution of sulfuric acid is filled, and the battery is washed, labeled, tested, and packed. It should be noted here that the quantity of sulfuric acid filled in a battery varies with the type of battery manufactured. In case it is a wet-charged battery, it would be ready at this stage for distribution and use. Wastewater streams are generated in this section as a result of charging and washing the batteries. This wastewater is acidic and contains sulfuric acid. Among the most important factors in designing products around batteries (and batteries themselves) is the amount of power a battery of a given size and weight can produce. After all, the energy source for a device should not handicap the ready use of that device. The chemical reactions in the cell are the most important factor constraining energy density and the usefulness of batteries. In fact, the entire history of battery technology has been mostly a matter of finding and refining battery chemistries to pack more energy in ever-smaller packages. Today's batteries use a variety of chemical systems, some dating from the late nineteenth century as mentioned previously, and some hardly a decade old. The diversity results from each having distinct benefits for particular applications. The following battery chemistries are the most popular for portable computer, cell phone, power system, and peripheral applications. Source: Rosch, W., Batteries: History, Present, and Future of Battery Technology, EXTREMETECH. Available at http:// www.extremetech.com/, June 2001; U.S. EPA, Battery Manufacturing, U.S. Environmental Protection Agency, Washington, DC, 1981. N.G. = Not given. military and space exploration programs. Therefore, these two subcategories are out of the scope of this chapter. However, in the subsequent paragraphs, brief descriptions of other subcategories are provided. Subcategory A encompasses the manufacture of all batteries in which cadmium is the reactive anode material. Cadmium anode batteries currently manufactured are based on nickel-cadmium, silver-cadmium, and mercury-cadmium couples (Table 32.1). The manufacture of cadmium anode batteries uses various raw materials, which comprises cadmium or cadmium salts (mainly nitrates and oxides) to produce cell cathodes; nickel powder and either nickel or nickel-plated steel screen to make the electrode support structures; nylon and polypropylene, for use in manufacturing the cell separators; and either sodium or potassium hydroxide, for use as process chemicals and as the cell electrolyte. Cobalt salts may be added to some electrodes. Batteries of this subcategory are predominantly rechargeable and find application in calculators, cell phones, laptops, and other portable electronic devices, in addition to a variety of industrial applications.14 A typical example is the nickel-cadmium battery described below. The most popular rechargeable/storage batteries in consumer electronic equipment are nickel-cadmium cells, often called NiCads. As the name implies, these batteries use cathodes made from nickel and anodes from cadmium. Their most endearing characteristic is the capability to withstand a huge number of full charge/discharge cycles, often in the range of 500-1000 cycles, without deteriorating past the point of usefulness. NiCads also are of relatively lightweight, have a good energy storage density (although about half that of alkaline cells), and tolerate trickle charging (when properly designed). On the downside, cadmium is toxic, thus the requirement for warning labels that implore the user to be cautious with them and properly dispose of them.1 In most batteries the output voltage declines as the battery discharges. This is so because the reactions within the cell increase its internal resistance. This is, however, not the case with NiCads. The NiCads batteries have a very low internal resistance, meaning they can create high currents that change little as the cell discharges. Consequently, the NiCad cell produces a nearly constant voltage until it becomes almost completely discharged, at which point its output voltage falls precipitously. This constant voltage is an advantage to the circuit designer because fewer allowances need to be made for voltage variations. However, the constant voltage also makes determining the state of a NiCad's charge nearly impossible. As a result, most battery-powered computers estimate the remaining battery power from the time they have been operating and the known battery capacity rather than actually checking the battery state. NiCads are known for another drawback: memory. When some NiCads are partly discharged, then later recharged, they may lose capacity. Chemically, recharging NiCads before they are fully discharged often results in the formation of cadmium crystals on the anodes of the cell. The crystals act like a chemical memory system, marking a second discharge state for the cell. When the cell gets discharged to this secondary discharge state, its output abruptly falls despite further capacity being available within the cell. In subsequent cycles, the cell remembers this second discharge level, which further aggravates the situation by reinforcing the memory of the second discharge state. The full capacity of the cell would only be recovered by nudging the cell past this second discharge state. This should erase the memory and restore full cell capacity. This situation would soon change as newer NiCads are free from memory effects. The lead subcategory encompasses the lead-acid reserve cells and more familiar lead-acid storage batteries. This subcategory of batteries is the largest both in terms of number of plants and in volume of production, as well as the total volume of wastewater generated. The raw materials for all lead anode battery types include lead, lead oxide, lead alloys, sulfuric acid, material for making separators, as well as battery cases, covers, and filter caps. Carbon, barium sulfate, and some fibrous materials may be used as additional materials in the manufacture of electrodes.5 Although lead anode batteries are manufactured using similar materials and employing the same basic chemistry, they differ significantly in configuration depending on the end use. For instance, lead-acid battery products include cells with immobilized electrolyte for use in portable tools, lanterns; conventional rectangular batteries for use in automotive SLI applications; sealed batteries for SLI use, and a wide variety of batteries designed for industrial applications. Like the NiCads, lead anode batteries are also rechargeable. Besides, these types of batteries may be described as wet charged such as the SLI or dry charged such as damp-charged batteries (damp batteries) and dehydrated plate batteries (dehydrated batteries). Damp and dehydrated batteries may sometimes be described as gelled lead-acid cells.1 Dehydrated batteries are manufactured by charging the electrodes in open tanks (open formation), which is subsequently followed by rinsing and dehydration processes. Thereafter the batteries are assembled and shipped to various destinations. The wet-charged batteries, on the other hand, may be manufactured by either closed formation processes or open formation processes. Of the three categories, the dehydrated plate batteries afford significantly longer shelf life than wet and damp batteries. Most uninterruptible power systems rely on gelled lead-acid cells for their power reserves. In this application, they require little maintenance. A typical example, described below, is the wet-charged lead-acid battery. Source: Rosch, W., Batteries: History, Present, and Future of Battery Technology, EXTREMETECH. Available at http://www.extremetech.com/, June 2001. Early lead-acid cells consequently required regular maintenance to keep the water/acid inside the cell at the proper level. 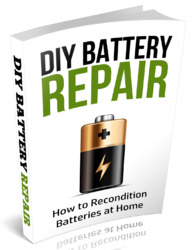 Since only the water electrolyzes in the battery, it is the only one needed to be replaced regularly. To avoid contaminating the battery chemistry, manufacturers recommend the use of distilled water in replenishing the battery. In stationary applications, lead-acid batteries were once encased in glass. Not only would such designs resist the internal acid, but also they would allow maintenance workers to quickly assess the condition of the cells. For automotive applications, however, a more shatterproof case is required for which engineers developed hard rubber or plastic enclosures. In addition, the convenience of using lead-acid batteries is immensely increased by sealing the cells. The result is the so-called maintenance-free battery. Since the vapors within the sealed cell cannot escape, electrolysis losses are minimized. For this reason, maintenance-free batteries never need water. But on the downside, maintenance-free batteries are not entirely trouble-free. They still have acid sloshing around inside them, which may leak out through the battery vent, thereby either damaging the battery compartment or the equipment in which the battery is located. To overcome these shortcomings, two ways of eliminating the slosh have been developed. One way is to keep the liquid acid (electrolyte) inside a plastic separator (typically a microporous polyolefin or polyethylene) between cell electrodes. The second alternative is to chemically combine the liquid electrolyte with other compounds that turn it into a gel (a colloidal form like gelatin), which is less apt to leak out. The Leclanche battery subcategory is a type of zinc battery that uses an acidic electrolyte and zinc anode. The major raw materials used in the manufacture of batteries in this subcategory include zinc, mercury, carbon, manganese dioxide, ammonium chloride, zinc chloride, silver chloride paper, starch, flour, and pitch (or similar materials) for sealing cells. Plastics are also used in producing flat cells for photographic use. The zinc is most often obtained as sheet zinc preformed into cans, which serve as both cell anode and container. However, some facilities form and clean the cans on-site. Zinc powder may also be used in one such type of cells. Where mercury is used to amalgamate the zinc and to reduce internal corrosion in the battery, it is generally added with the cell electrolyte or the separator. It amounts to approximately 1.7% by weight of the zinc contained in these cells. Plants involved in the manufacture of cells in this subcategory produce conventional carbon-zinc Leclanche cells as well as silver chloride-zinc and carbon-zinc air cells. All of these batteries have in common the use of an acidic (chloride) electrolyte and a zinc anode. In this respect they differ from subcat-egory G, which, although it has a zinc anode, uses an alkaline electrolyte. A wide variety of cells and battery configurations and sizes are produced in this subcategory comprising cylindrical cells in sizes from AAA to No. 6, flat cells, which are stacked to produce rectangular 9-V transistor batteries, various rectangular lantern batteries, and flat sheet batteries for photographic applications. Cells of this subcategory are of the primary type (Table 32.1). Although the above cell configurations are used in the construction of this cell subcategory, there are some differences in the manufacturing process. These differences arise from the differences in the cell separators chosen, that is, cooked paste, uncooked paste, or paste paper. Another notable difference may arise from the electrolyte used. For instance, among carbon-zinc air batteries, only dry cells, which use ammonium chloride in the electrolyte, are included in this subcategory; otherwise carbon-zinc air depolarized batteries, which use alkaline electrolyte, are not included in the Leclanche subcategory, but rather, included in subcategory G, the zinc battery. Typical examples described below are the carbon-zinc and zinc-air battery types. Batteries of this subcategory resemble the Leclanche cells in having a zinc anode, while they differ inasmuch as the electrolyte is alkaline. 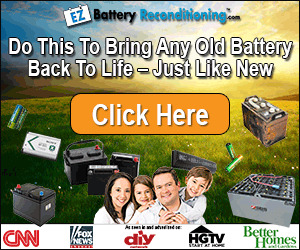 As such, batteries in this subcategory may be referred to or described as zinc anode alkaline electrolyte batteries. These batteries are at present manufactured using six different cathode reactants, namely, manganese dioxide, mercury oxide, nickel hydroxide, monovalent and divalent oxides of silver, and atmospheric oxygen (Table 32.1). The raw materials used in producing these batteries include zinc, zinc oxide, mercury, manganese dioxide, carbon, silver, silver oxide, silver peroxide, mercury oxide, nickel and nickel compounds, cadmium oxide potassium hydroxide, sodium hydroxide, steel, and paper. Zinc and zinc oxide are used to manufacture anodes, while mercury is used both to manufacture mercuric oxide cell cathode material and to amalgamate zinc anode to limit corrosion and self-discharge. Other cathode materials may be made from (a) manganese dioxide, which is blended with carbon to form cathodes for alkaline manganese cells; (b) silver, which is used to produce silver oxide and silver peroxide cathodes as well as wire screens that serve as support grids for cell electrodes; and (c) nickel and nickel compounds, which are used to produce cathodes for nickel-zinc batteries. The electrolytes used in these cells are either potassium hydroxide or sodium hydroxide. Finally, the batteries are encased in steel material, while paper and plastics, respectively, are used as separators and insulating components. Typically, the alkaline zinc batteries construction (as opposed to chemistry) differs significantly from ordinary carbon-zinc cells. Alkaline cells are effectively turned inside out. Unlike the zinc battery of subcategory D, the shell of the alkaline battery is nothing more than a protective shell, which does not play a part in the overall chemical reaction. The anode of the cell is a gelled mixture of powered zinc combined with the electrolyte (which itself is a mixture of potassium hydroxide and water), and the combination is linked to the negative terminal of the cell by a brass spike running up the middle of the cell. The cathode, a mixture of carbon and manganese dioxide, surrounds the anode and electrolyte, separated by a layer of nonwoven fabric, such as polyester. This is the construction of a Duracell alkaline battery.1 Depending on the application, alkaline cells can last for 4-9 times the life of more traditional carbon-zinc cells. The advantage is greatest under heavy loads that are infrequently used, that is, something that draws heavy current for an hour once a day rather than a few minutes of each hour. In this respect, an alkaline zinc anode cell is better than typical carbon-zinc cells, which nominally produce 1.5 V, a voltage only available when little current is drawn from the cell during its initial discharge. As the load increases the voltage of the cell diminishes and the charge of the cell also decreases. This subcategory encompasses the manufacture of batteries, which employ lithium as the reactive anode material. However, this classification may not account for the recent developments in lithium battery technologies, which use either the lithium ion or the lithium polymer not as anodes but rather as cathodes and "complexed" electrolytes, respectively.1 Therefore, in addition to the traditional lithium anode batteries, these newly developed variants are conveniently classified under the lithium battery subcategory and their construction is described in detail under Sections 32.4.6.2 and 32.4.6.3, respectively. A variety of cathode materials that have been applied earlier in the manufacture of lithium cells include iodine, sulfur dioxide, thionyl chloride, and iron disulfide, which were predominant in the 1970s and 1980s (Table 32.1). Lithium battery technology has greatly developed to various designs based on lithium ion as well as lithium polymer battery technologies, respective-ly.1 Typical examples described below are the lithium-iron disulfide, lithium-ion, and lithium polymer battery types. Batteries based on lithium metal were developed and manufactured in the 1970s, and in the 1980s some companies introduced commercial rechargeable cells based on metallic lithium. Such batteries quickly earned a reputation for doubtful safety. To prevent problems caused by reactive metallic lithium, battery makers refined their designs to keep the lithium in its ionic state. In this way, they were able to reap the electrochemical benefits of lithium-based cells without the safety issues associated with the pure metal. In lithium-ion cells, the lithium ions are absorbed into the active material of the electrodes rather than being plated out as metal. The typical lithium-ion cells use carbon for its anode and lithium cobalt dioxide as the cathode. The electrolyte is usually based on a lithium salt in solution. Lithium batteries offer higher storage densities than nickel-metal hydride cells (Table 32.3). Besides, lithium-ion cells also lack the memory effect that plagued early NiCads. On a downward side, however, current lithium cells have a higher internal resistance than NiCads and consequently cannot deliver high currents.1 Moreover, the life of lithium cells is more limited than that of nickelbased designs, although lithium-ion cells withstand hundreds of charge/recharge cycles. Since lithium-ion cells use a liquid electrolyte (although one that may be constrained in a fabric separator), cell designs are limited to the familiar cylindrical battery form. Apart from the classical subcategories described above, there are other cell subcategories that do not fit into the above classification. Such cells include (a) the sodium/sulfur battery that uses liquid sulfur for the positive electrode, (b) redox batteries, (c) unusual batteries such as the urine battery, ampoule battery, thin-film battery, and homebrew battery,9 and (d) nickel-metal hydride batteries, which have, as one of the electrodes, metal alloys that have a very high capacity to store atomic hydrogen, and hence called hydrides. Although the technologies for the sodium/sulfur, redox, and unusual batteries are very interesting, their practical applications are still limited, and therefore no further discussion is devoted to them in this chapter. However, the metal-hydride technology is finding such an application in the manufacture of rechargeable batteries that are currently used in a number of devices. This technology development shall be explored briefly by looking at the nickelmetal hydride battery. Source: Energizer: Nickel-Metal Hydride Application Manual, June 2001, Eveready battery Co. Inc., www.data.energizer.com. exothermic, that is, they produce heat. As the NiMH cell approaches full charge, its temperature can rise dramatically. Consequently, chargers are best designed for one or the other type of cell. How does Gaston plantes wetcell cylinder battery work in building?